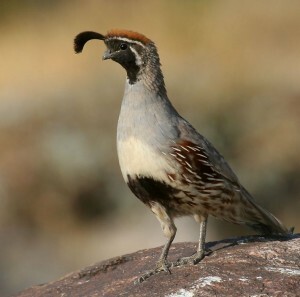 The Gambel’s Quail, also called the Arizona quail, top knot quail or desert quail, dwell in the desert region of South America. Being named after the famous naturalist of the 19th century, William Gambel, they are pear shaped with unique top knots on their head. 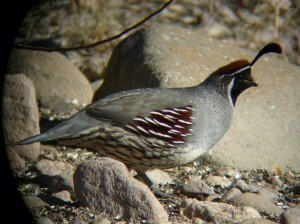 Their bodies are gray-feathered, with the males having copper-colored feathers on their head top, a black face, patches of black on their breasts and white-striped eyes. Females, on the other hand, have a lesser prominent plumage compared to their male counterparts. Diet Different types of seeds, leaves, grasses, shrubs and fruits of the cactus. Some of them also eat insects. 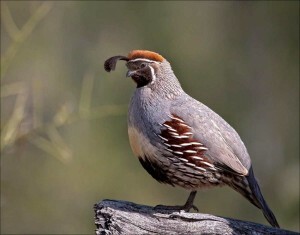 Owners will have an enjoyable experience raising these unique looking birds that are a pleasure to watch. 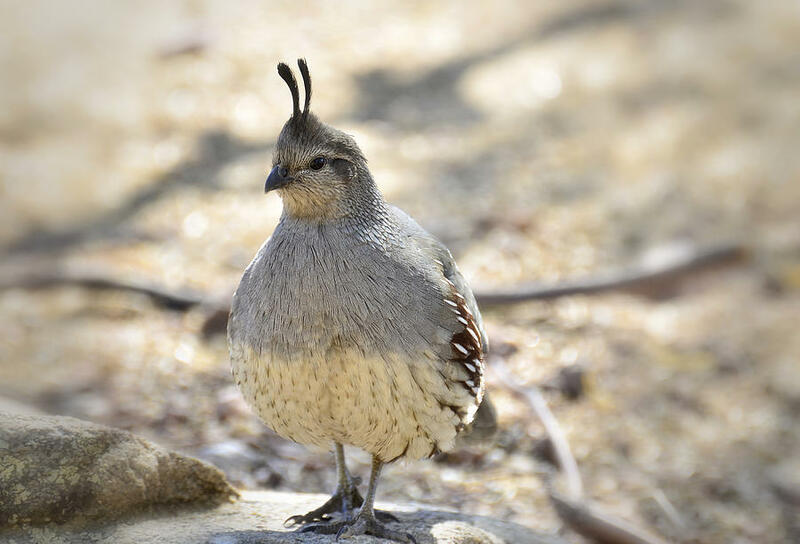 These birds thrive well in large outdoor aviaries or pens. 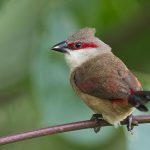 Their cage should be spacious and made of mesh wire as these birds require a lot of space along with sufficient air to survive in a healthy way. Keeping soft wood, or natural perches inside the cage will help them fly about from one perch to the other. You can also keep a pan of sand at the bottom of the cage for them to enjoy a pleasant sand bath. 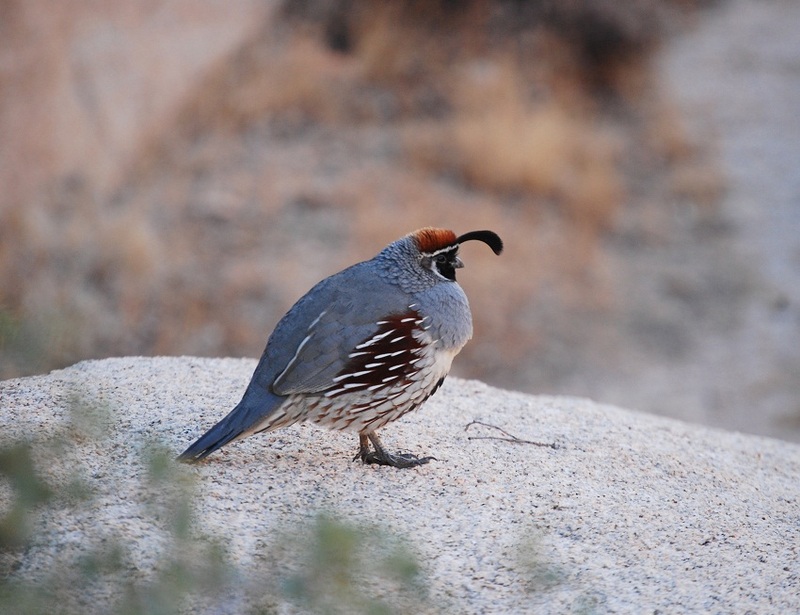 Like any other pet bird, the quail’s cage will require newspaper or paper towel substrate to ensure cleanliness and hygiene. Keep your bird’s dwelling place well lit by placing artificial full spectrum lights near the cage. These active, energetic birds are great flyers, loving to move about the cage enthusiastically. However, they tend to get nervous as well as anxious at times. Most birds have a docile and submissive disposition, but some of them, particularly the males show aggression during the mating season. It is advisable not to introduce any new birds into the cage during this time. They have trouble in settling down when human beings are around. Thus, it is best to watch them from a distance rather than fondling them. These quails are not to be kept with the Coturnix quail as they tend to get violent at each other with the Gambel’s quail going to the extent of killing the latter. In the wild, they are monogamous, living with a single partner throughout their life. 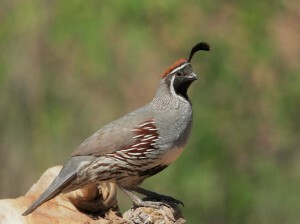 However, when petted, they can be bred with multiple partners. 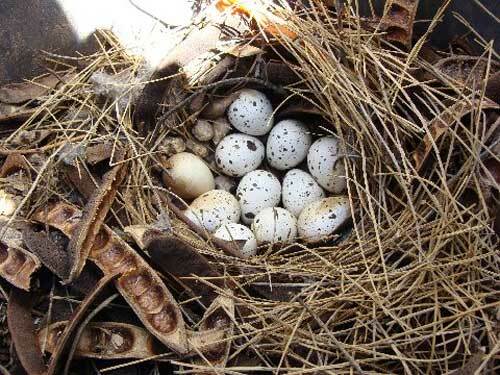 As they love forming a covey in the wild, keep many birds in the aviary or pen during the cold winters, barring the mating season to give them warmth and comfort. They should be fed with nutritious seeds, spray millets, grains, cracked corn, whole wheat berries and meal worms. The presence of grit and cuttlebone in the cage will make up for any calcium deficiency, mainly in the females because of egg-laying. Provision of fresh, clean water on a daily basis is essential. Cleaning the birds by bathing them when required helps in maintaining a proper hygiene. 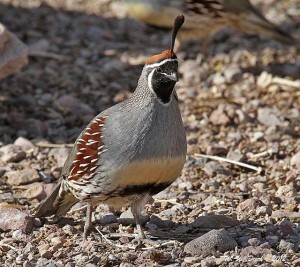 They love taking a dust bath just like the California quail, after which their cages should be tidied up. 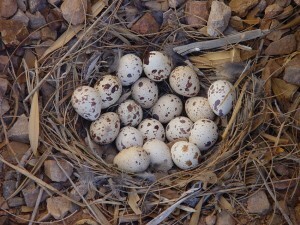 These birds do not have a long lifespan and need sufficient water so that they do not get dehydrated. 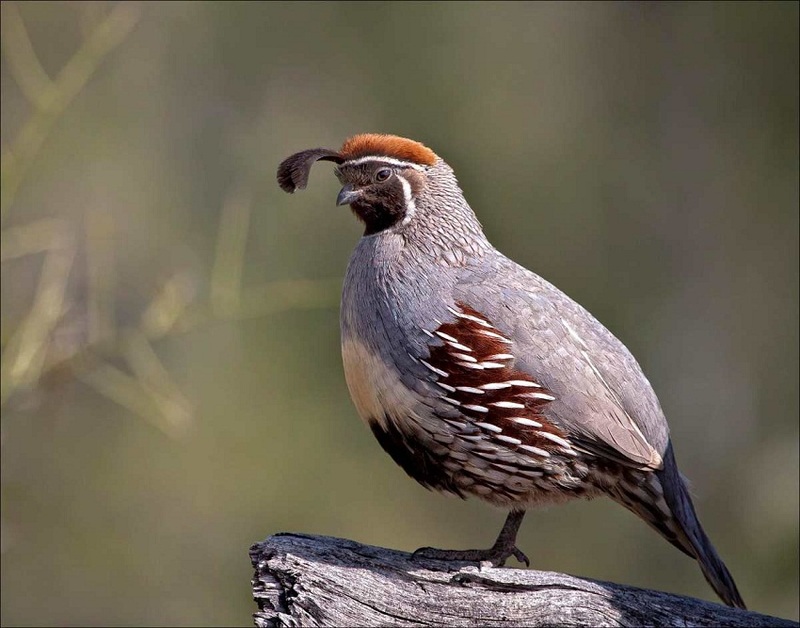 They are afflicted by certain common diseases suffered by most birds of the quail family, like coccidiosis, mites, scaley legs, histomoniasis (blackhead), capillary worms and egg binding. Gambel’s quails can cost around $80-$100. They are often confused with the California quail who are said to be their nearest kin, because of their similarity in size, plumage, and color, though the latter has a scaly appearance compared to the Gambel quail. 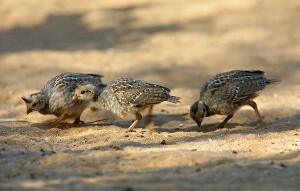 These quails are noisy while communicating with each other, raising an alarm call and running away if one tries to get near them. During the mating period, the males emit a soft call to attract its female counterpart whereas both of them produce a short squealing sound to express their happiness when mating. Between 1993 and 1995 over 1.2 million birds were hunted and killed every year. At present game hunting is considered to be illegal in the United States of America.